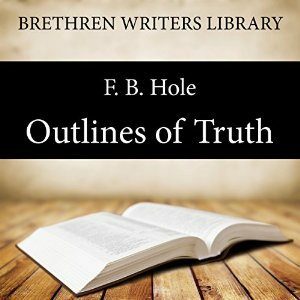 “OUTLINES OF TRUTH’ (Being Bible Talks on Important Subjects Connected with the Foundations of Christianity) explains many foundational scriptural truths in an easy to understand way, and includes subjects such as : Faith & Works, Peace & Deliverance, Safety & Sanctification, Law & Grace, ‘Sin’ & ‘Sins’, The New Nature & the Old, ‘Blood’& ‘Water’, Grace & Discipleship, Election & Free Grace, Israel & the Church, Worship & Service, The Rapture & the Appearing. This valuable book supplies sound Biblical teaching for today’s Church among whom is much misunderstanding and lack of scriptural knowledge. Frank Binford Hole( 1874-1964) was a man of God. The conspicuous feature of his life was that he lived and laboured in the Christian Faith, and was constrained to do so by personal experience of the love of Christ. At an early age he became a full-time worker in the service of Christ in UK Assemblies. His gifts from God manifested themselves in three different ways: firstly as evangelist; secondly as teacher; and lastly as publisher. He wrote several valuable books, “Outlines of Truth”, "The Great Salvation" and another one equally valuable "Foundations of the Faith". He also edited and contributed many articles to a small periodical called "Edification" and for many years "Scripture Truth".